Mum always says: don't go on stage looking like a fool! Ok, maybe she doesn't - but she probably tells you dress to impress for any important career event. The same holds true for conferences and pitches where your personal / company brand is presenting in front of hundreds of folks. We decided to *tweak* a spouse of Aleberry's deck before he went on stage with the most engineer / lawyer deck! :) It's ok, we love you Aaron! Here's a quick visual preview of why design matters, especially at conferences. We'll include a few notes below of considerations if you can't quite get to Aleberry in time. 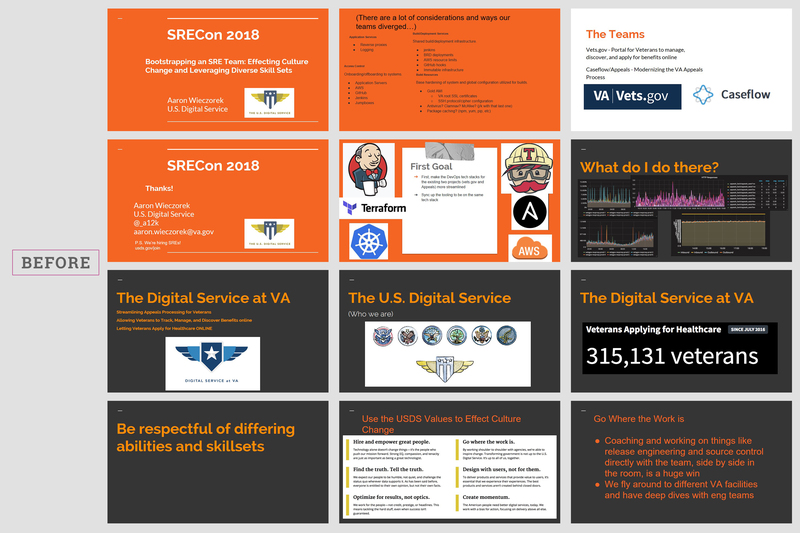 Aaron Wieczorek, former DevOps/SRE Lead at USDS - VA and now the General Counsel of USDS, gave a talk on Bootstrapping an SRE Team at SRECon 2018. The messages on navigating culture, bootstrapping teams, and the important work the United States Digital Service is doing were vital to the talk. Like most of the founders we work with, the foundation is important & world-changing - but the message tends to get lost in the deck & cluttered layouts. The "before" is a pretty standard example of what we first see! This deck was a bit different for us, since Aaron isn't fundraising - and while he was discussing USDS, the talk was focused on guidelines to help other folks. However, many of the components were similar: story telling, messaging, key metrics. DON'T ALLOW PEOPLE TO READ YOUR SCREEN (instead of listen to you). You were asked to speak for a reason! They want you! Your presentation is like your assistant. Let it be your aid - not the other way around. This means not typing your entire script on every slide. 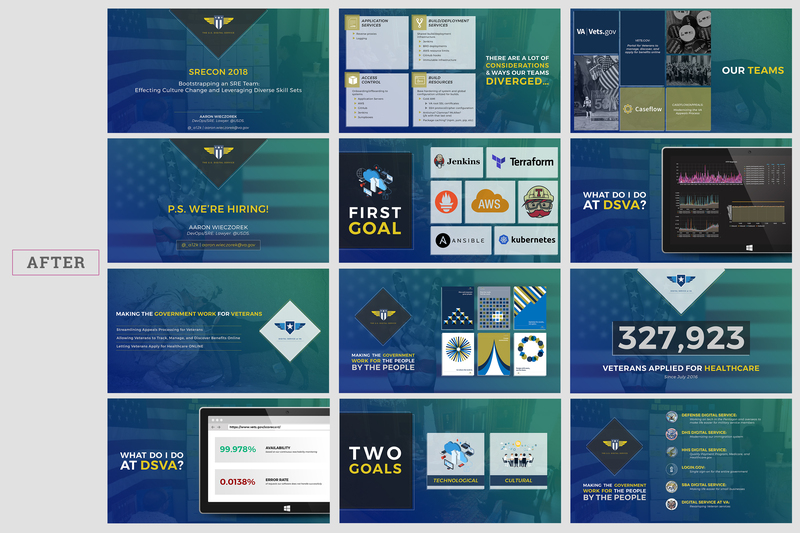 There were several slides where we removed all the text and replaced them with images + taglines (an example is the USDS Values). CONTENT & MESSAGING ORGANIZATION: While we didn't have as much time as we typically like, we were able to spend a bit of time on messaging & organization. We split up a few slides that felt cluttered, highlighted some important messages, and removed unnecessary/repetitive content. We moved a few slides around to flow like a story, which gave a better education on rules/guidelines to follow. IMAGERY: For the most part, if you have a large image - make it "bleed" into the edge of the screen. This instant edit will do wonders for your use of white space & feel like an Aleberry touched your deck! COLORS: Use color appropriately. No black on orange. Use bright colors to highlight important words & metrics. We like to use a dark charcoals that match the tint of your brand instead of pitch black. ALIGNMENT: If you are into photography, you can somewhat take the rule of thirds to think about spacing & alignment. Also please use the ALIGN tool freely given in PowerPoint & Google Slides! This will prevent the effect of a cut & paste 3rd grade science fair poster. HIGHLIGHT IMPORTANT MESSAGES: Don't let your key one-liners get lost! Highlight it or make it the only thing on the slide. An example here is on the CLOSE SLIDE. Aleberry made P.S. WE ARE HIRING the largest message followed by contact information. The result of this was literally folks in the audience pulling up the USDS website while Aaron was talking (visual proof on social media)! HIGHLIGHT KEY METRICS: Pick the important stats & highlight those; you don't need an entire excel sheet on a slide. Examples can be seen on the two statistics slides above. I removed a bunch of duplicate measurements & highlighted the positive/negative rates. If all else fails, get in touch with Aleberry!